The L-TEK FF1705 platform is based on the low cost, low power MultiConnect® xDot™ Module from MultiTech. It is a packed complete with an integrated DAPLink interface. All in an Arduino form factor. L-Tek FF1705 platform is integrated with a DAPLink programming and debug interface. 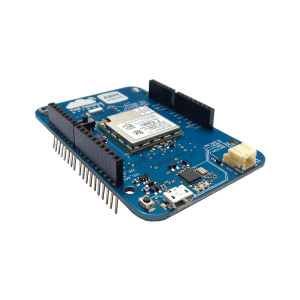 Complete with Adruino compatible headers, you can use this platform to prototype applications using a wide range of IO boards and peripherals supported by mbed in the the mbed Component library. You can use this platform also as a shield when fitted to an Arduino form factor MCU developlent platform by running the MultiTech AT Command Firmware. You may purchase L-Tek FF1705 here.